When Army Major Susan Turner (Cobie Smulders) is arrested for Treason, Jack Reacher (Tom Cruise) will stop at nothing to prove her innocence and to uncover the truth behind a major government conspiracy involving soldiers who are being killed. Reacher is a force to be reckoned with. However, a revelation in his personal life could well prove to be his Achilles heel. Edward Zwick’s film starts with a much trailed scene. Cops pull up outside a diner where a number of severely beaten men lie writhing on the floor. A man sits calmly at the counter, his back to the chaos. Two of the cops enter the diner and cuff the man. He turns around and states that two things are going to happen in the next 90 seconds. First the phone is going to ring. Second, the cops are going to be wearing the cuffs. No need to guess what happens next. Thus, Jack Reacher: Never Go Back starts and in a rather satisfying way. Within minutes, we are back in Reacher's world, ready for another adventure. It is just a shame that the film fails to deliver on the promise of its introduction. I have not read any of author, Lee Child’s, Jack Reacher books so I may well be missing something. However, I found Zwick’s movie wholly underwhelming. There is a distinct lack of chemistry between Reacher and Turner and the film’s central conspiracy is dull and forgettable. To give this film its due, it features a strong female character in Major Turner and the action set pieces are well put together. One particular sequence takes place in a restaurant kitchen. However, while it was reasonably diverting, I found myself remembering the superior kitchen fight scene in The Raid 2 - not a good sign. In addition, oh how I missed the genius of Werner Herzog from Christopher McQuarrie’s first Jack Reacher film. While no one could live up to Herzog’s The Zec, Patrick Heusinger’s The Hunter was memorable only for his dentistry - those are some remarkable pearly whites. In addition to solving a military mystery, Jack Reacher has to deal with a significant complication in his personal life. I cannot (without straying into spoiler territory) explain exactly what this complication involves. However, suffice it to say that this 'complication' just didn’t work for me and felt like an extremely irritating and uneven plot device. All in all, Jack Reacher: Never Go Back was a disappointment - even the film’s title feels like an own goal. Jack Reacher: Never Go Back secured a 12A rating from the BBFC. However, it should be noted that this film is pretty violent. While there is little blood and injuries are not dwelt on, the fight scenes are brutal - worth bearing in mind if you are considering taking children to see this film. This film is based on Jack Reacher: Never Go Back, author Lee Child's 18th novel in the best-selling Jack Reacher series - a series that has seen 100 million books sold worldwide. 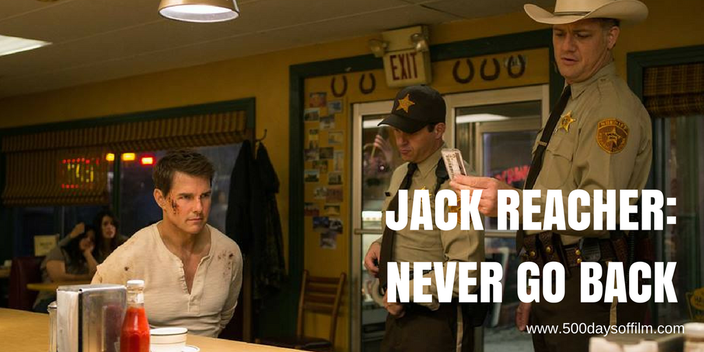 Have you seen Jack Reacher: Never Go Back? If you have, what did you think of this film? Let me know - you can leave me a comment in the box below.